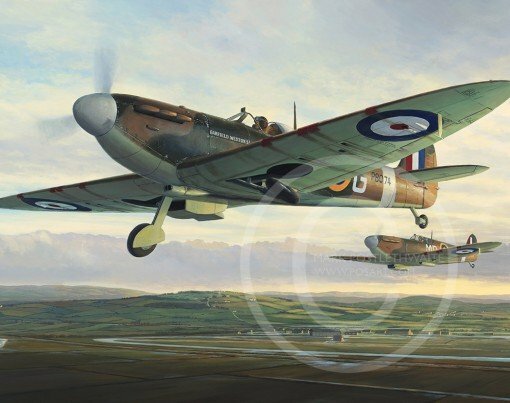 The “Garfield Weston SI” Spitfire takes off from RAF Eglinton in Northern Ireland, piloted by Plt Off Roland “Bud” Wolfe, of Cresco, Nebraska. Named after Canadian industrialist and British Member of Parliament W. Garfield Weston, (left) a member of the wartime government led by Winston Churchill, (right) the story surrounding this presentation Spitfire is truly remarkable. In August 1940, after the loss of 16 RAF Spitfire and Hurricane fighter planes in one day at the height of the Battle of Britain, Weston walked into the Ministry of Aircraft Production and handed fellow Canadian Lord Beaverbrook a blank cheque, saying “I can’t replace the men, but I’ll replace the machines.” Beaverbook filled in the amount for £100,000 – the cost of replacing the 16 downed fighter aircraft. The donation was widely publicized and helped inspire the creation of hundreds of local Spitfire Funds across Great Britain and the Commonwealth, raising millions of dollars and pounds.